When California officials got serious about building two giant tunnels to divert freshwater out of the Sacramento-San Joaquin Delta, it didn’t take critics long to propose alternatives. One of the first was a grassroots scheme that, at first, seemed radical and counterintuitive: Let winter floods retake vast parts of the San Joaquin Valley – the very farmland that needs those Delta water diversions. The floods would recharge depleted groundwater that could then be used to irrigate the farms, preventing the need for Delta water exports. The idea came in 2007 from Tom Zuckerman, then an attorney for the Central Delta Water Agency, one of many groups still battling the tunnel project. Zuckerman drafted it in the form of a 26-page “white paper” that he presented to the Delta Vision Blue Ribbon Task Force, a panel appointed by then-Governor Arnold Schwarzenegger. The proposal was later incorporated by Restore the Delta, another group opposing the tunnels, into its broader “Sustainable Water Plan for California.” And then it largely faded from view. In recent years, other developments have focused fresh attention on California’s serious groundwater problems: The state’s ongoing drought, passage of the Sustainable Groundwater Management Act in 2014 and new scientific research into floodplain restoration and groundwater recharge. As a result, Zuckerman’s idea no longer seems outlandish. 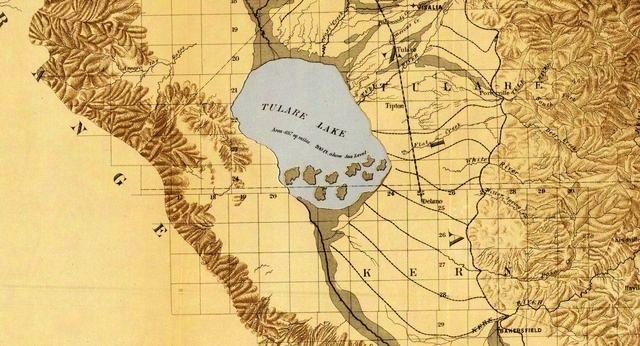 Zuckerman’s proposal centers on reviving the historic Tulare Lake, located in the Southern San Joaquin Valley between Fresno and Bakersfield. Before California was settled, it was the largest natural freshwater lake west of the Mississippi River, fed by snowmelt from numerous streams pouring out of the Southern Sierra Nevada. He proposes to bring the lake back by strategically breaching levees and directing winter snowmelt back into the Tulare Basin. The same process could be used further north in the San Joaquin Valley to recharge other aquifers, Zuckerman said. In this way, over time, the region could become self-reliant for its water needs. Gutierrez agrees the idea has merit. But he said it will never displace a significant amount of Delta water diversions. That’s because groundwater depletion in the San Joaquin Valley is so severe that it will take a very long time to bring back. And flood-producing storms are actually somewhat rare in the San Joaquin Valley – on the order of once every 20 years. In other words, he says, the region needs Delta water exports for a long time to come. Which is where the $15 billion tunnel project comes in. Known as California WaterFix, it proposes improved infrastructure to divert Delta water to the San Joaquin Valley and the Los Angeles region. In many areas, the flooding Zuckerman proposes would not require any changes in land use, and would not harm existing crops. In 2015, a University of California team published a study on groundwater recharge potential throughout the state. It was based on an analysis of soil conditions capable of absorbing large amounts of floodwaters, and crop types that could withstand flooding. The study found there are 3.6 million acres (1.5 million hectares) of suitable soils with “excellent” or “good” potential for groundwater recharge. 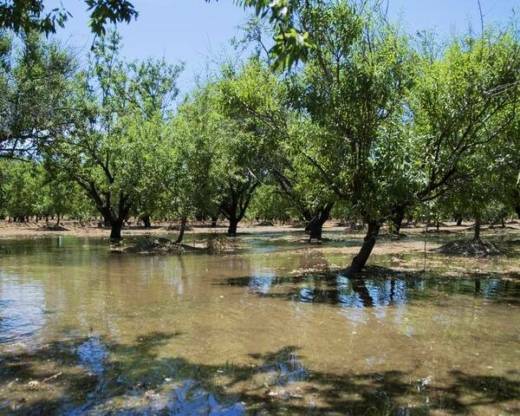 Crops identified as being tolerant of flooding include wine grapes, pears, prunes, walnuts and some types of almonds. In total, the study concluded these lands could absorb as much as 1.2million acre-feet (1.4 billion cubic meters) of water per day. Five days of recharge at that rate would exceed a year’s worth of Delta water diversions. The research team subsequently made their findings available in a web-based mapping tool. “I really think it’s doable – politically and economically – to do this as soon as people catch on that water on the floodplain is not a bad thing for agriculture,” said John Cain, director of conservation for California flood management at the environmental group American Rivers. One such project will reroute levees on Paradise Cut in the south Delta to create a new floodplain for the San Joaquin River near Lathrop. It was recently awarded $2.1 million in grants by the Delta Conservancy. The state Wildlife Conservation Board also recently funded two other floodplain restoration projects along the San Joaquin River near Firebaugh and at Great Valley Grasslands State Park. Another motivation for these projects, Cain says, is flood protection. As old levees age, they become increasingly expensive to maintain, and the demand for state and federal funds to help with these projects increases. So local governments and levee agencies are looking for alternatives – including restoring floodplains to absorb the water instead. The obligation to restore endangered fish species is another motivation. By refilling aquifers, rivers can remain wet longer through the year because their surface flow is naturally connected to groundwater. Instead, many California rivers today are considered “losing” streams: Groundwater is so depleted that rivers flowing on the surface are constantly losing huge volumes of water to the aquifer. Yet it’s not enough to refill those aquifers, because groundwater is still getting pumped out too fast. Gutierrez says the Sustainable Groundwater Management Act is poised to change this game. As the law takes effect over the next two decades, many water agencies will be required to find ways to recharge groundwater, especially in the San Joaquin Valley, where most aquifers are known to be in critical condition. He’s certain the solution in many cases will be floodplain restoration. But it won’t work for all aquifers, because a century of land development has cut off their connection to floodwaters. For aquifers near levees, the solution is simple: Open the levee where water can spill onto the most porous soil. In other cases, new water diversion channels may have to be built. These costs will be passed on to water users, which could make the recharged groundwater very expensive. Although Cain is a leading advocate for such projects, he said there probably aren’t enough groundwater recharge opportunities to offset a significant share of Delta water exports.